2013 Stereophile Record To Die For (R2D4)! Customer Reviews (4.58 Stars) 12 person(s) rated this product. Unfortunately I bought 4 of the Acoustic Sounds 45rpm remastered Jazz Lp's and after listening to each one it first made me think there was something wrong with my system or turntable setup. They all have the same issue for me. They all are lean across the whole spectrum, and lack harmonic richness and tone. Sorry just completely wrong for me. I think you can be fooled with these records, but I'm sorry there just not right. I have compared them to the Original Lp's(several Stampers),Classic Record Reissues, and even the redbook Cd's and these Acoustic Sound versions fall short for me. I will be selling these and prefer the Classic Record reissues. 2 stars for the quietness of the vinyl and not the recording. Sorry Acoustic Sounds, just my opinion. Just played the AP 45RPM pressing of this classic Verve LP for the first time. WOW! I have a regular 1970's domestic pressing I have heard for years for comparison. NO Comparison! The sound of Ray Brown's bass fills the room with a rich, full, musical bottom end that has to be experienced! Ella's voice is so 3D ..and Pop's trumpet is spot-on....If you know this classic, you will hear what you've been missing with this pressing....buy it today..
yes, surely great mastering job done, great sounding, but ... only where the record is flat!!!! unfortunately mine in NOT!!! pressing Not that good! The sound quality is amazing given the age of the recording. There’s a little tape hiss just audible in the dead quiet pieces which doesn’t detract from the excellent sound quality. 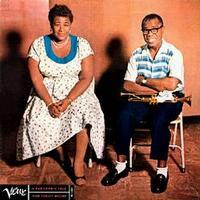 Ella’s voice is smooth as silk, Louis is gravely and joyous and the two just work together. The music is classic and …well as the title said…delightful! Great sound from the original analogue master tapes, the sweet sound of vinyl! Wow. I thought I had it good with the Speakers Corner copy, but this one blows it out of the water completely. It is difficult to find words to describe the experience of listening to this record. Personally, I felt like I was eavesdropping on a very private, intimate session between these two giants of jazz. I felt like I wasn't supposed to be sitting there with them, and yet, I was. Only when the music stopped was I reminded that it was just a vinyl record. Gorgeous soundstage and depth with a full-bodied, natural tone, Chad & Crew really nailed this one. Wow. Just get it while you still can. Beautiful, beautiful stuff here. There is a good reason the all time classics are just that, this album is a prime example. Albums like this stay in rotation forever.